Being a parent is not the easiest part of your life, so making it more convenient and comfortable for both you and your baby, is always a smart thing to strive for. There are many products nowadays that help you get more done with less effort. One of these products are video baby monitors. 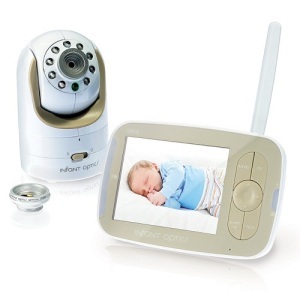 In this guide, we’re not only looking at the best video baby monitors, but also at the important aspects that you have to take into account when buying one of these products. 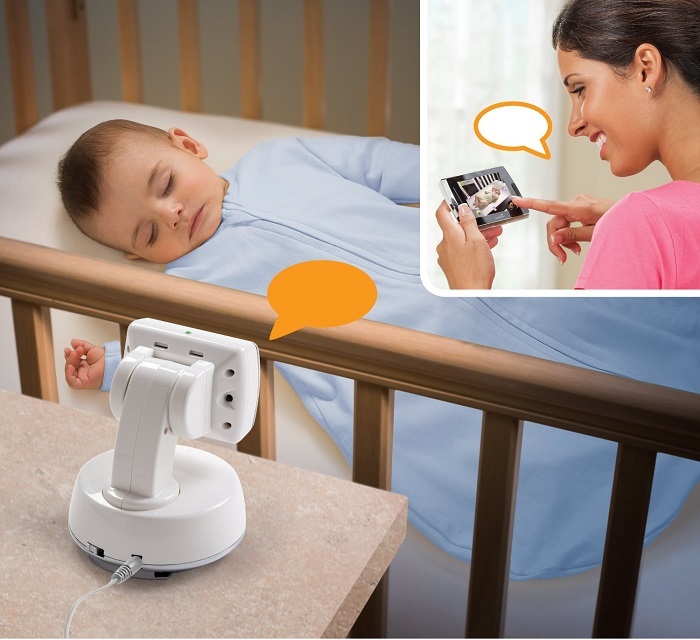 A baby monitor will help you keep an eye on your child even if you’re not in the same room. A video monitor is particularly helpful if your baby needs your constant attention due to a health condition. A baby monitor is a smart solution if you want to always be able to check on your child, and also go about other chores that you have to do. Before considering a certain model, there are some guidelines that you should take into account. After conducting our research, we found that there are a number of key aspects that need your attention. 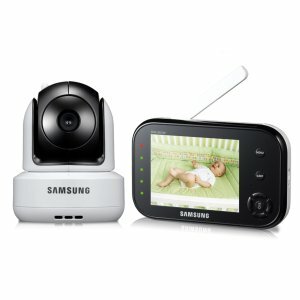 The most fundamental functionality of a baby video monitor is to alert you in case your child needs your attention. This is an ability that needs to function without any interference. Some monitors let you talk back to your baby. That’s a really convenient feature because, especially at night, you can calm your baby without entering the room and waking him up. Another useful feature that some monitors have is the ability to turn audio on and off based on the presence and absence of sound in that room. This is a smart feature, because it saves battery life in the long run. There are many aspects that fall under this section. One of the most important ones is the range. If you live in a larger house, especially, you would probably need a monitor that is capable of offering a quality transmission from a distance. Another aspect of video monitoring is night vision. You might want to be able to have constant visibility, and that’s not possible without built-in night vision technology. Most models that you can find have some sort of night vision, they differ in quality, though. Other useful features that fall under this aspect is the size of the screen. Monitors, generally have smaller screens than smartphones, for example, but you can find some that have a decent size. A final aspect that you should consider, is the ability to add extra cameras to the base unit, of course, if you need multiple to monitor from multiple angles, or different rooms. Depending on your specific needs and preferences, some monitors can be positioned next to the baby crib, others can be positioned farther away, so you can have a panoramic view of the entire room. With some models, you can conveniently attach them to your belt, so you ca always check on your baby. One of the important design factors that you should consider before making a choice, is battery life. As with most small electronics, one of the big disadvantages of some products is that they always need charging, when you have to use them. It’s only smart to check for battery life, and choose one that offers extended use. Most baby video monitors have built-in rechargeable batteries that have a span of 5 to 8 hours before they need to be plugged in. For safety reasons, you should always change the default password of your monitor, once you get it. If you miss this step, you open up the chance for your transmission to be seen by other people, or possibly be streamed online. Another feature that you can find in some baby monitors is a thermometer that helps you keep track of the comfort level in the baby’s room. Many parents don’t know this, but one of the frequent reasons for your baby crying or being restless is because he feels a temperature discomfort. The Infant Optics DXR-8 is one of the highest rated products of its kind. What most parents loved about this monitor is the ease of use and stylish design. Another aspect that was mentioned by many reviewers was the high quality video transmission and the nice size of the screen. It has multiple lenses: for normal view and zoom, that come included with the package, and an additional wide angle lens that you can purchase separately. It features a full color LCD display, that has a diagonal of 3.5 inches and has the ability to be sound-activated. The design is sleek, with a retractable antenna. You can fully control the camera remotely, customize the viewing angle and zoom. The Samsung SEW-3037W is another one of our favorites. It’s really easy to use and offers night vision capabilities up to a distance of 15 feet. It has a 3.5 inch color LCD display with a 640×480 resolution. The signal is at a constant quality, security and interference free level. You have total remote control, from adjusting viewing angle and zoom to turning the night light on and off. One of the most useful features is the 2 way talking capability, which is great when your baby needs soothing. The quiet mode will remove white background noise. You can attach up to 4 cameras. On the side you have 5 LED lights that indicate levels of sound. It’s easy to put it on a flat surface thanks to the flip stand. You can also attach it to your belt with a clip. 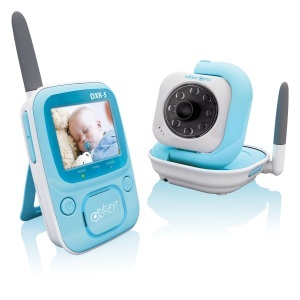 Infant Optics DXR-5 is currently the bestselling video baby monitor. Thousands of parents who bought this model rated it on average 4 out of 5 stars. Let’s take a look at the features that made this item a bestseller. 2.4 TFT screen with built-in microphone. 2.4 GHz static free digital wireless transmission that covers 800 feet in open areas and 150 in enclosed areas. It has a smart system to encrypt the transmission by using FHSS (Automatic Frequency Hoping System). What happens is that it jumps between different channels in the 2.4 GHz range, this way making a virtual encryption of the data. It features automatic IR night vision and A/C power: 6 V.
Another useful features of this video monitor is the ability to turn sound off after sensing no noises for 3 minutes. This is a smart feature as well, because it will save some battery life. It has a 2.4 inch, color LCD screen with infrared night vision capability. The maximum range is 520 feet. The parent unit has optical pan, tilt and LED sound level indicators. The battery is rechargeable and alerts you when you need to plug it in. You can attach up to 4 cameras to one parent unit. The Motorola MBP36S will help you keep an eye on everything. Most parents say that the big display makes it possible to see clearly from different angles. We’ve included it in our top list because it has smartly designed features and it received all around great ratings by most reviewers. It features 2.4GHz FHSS wireless technology. The display is a 3.5 inch color LCD display which puts it among the big screen monitors. Yo can control the camera remotely with ease. The audio function great; it goes both ways and is transmission is crystal clear. 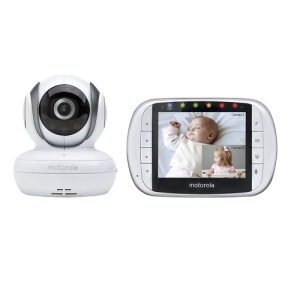 After going through our guide and taking a look at those that we consider to be the best video baby monitors, you should base your final decision further considering any specific needs or preferences that you have. There’s no one size fits all, but one thing’s sure: whichever monitor you decide as being the best for you, it’s ultimately going to make your life easier and more efficient. If you found this guide useful, don’t forget to share it, because it just might help someone else out as well. Thank you!